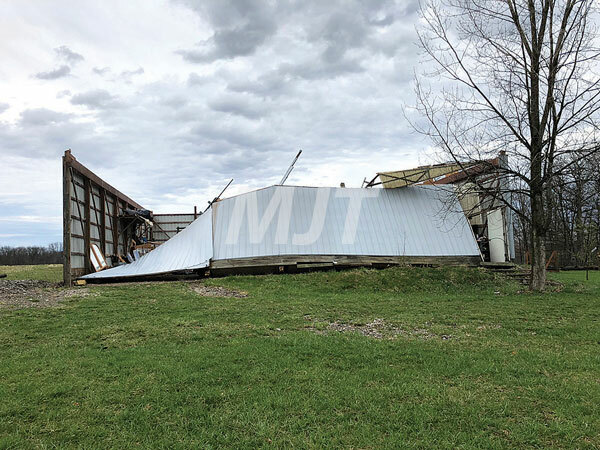 According to Brad Gilbert, Director of the Union County Emergency Management Agency, representatives of the National Weather Service toured a damage site on Whitestone Road, pictured above, Friday and confirmed straight line winds, with speeds up to as much as 80 mph, to be the cause. Chuckery and St. Paul Lutheran Church at routes 161 and 38 also had several large trees uprooted and taken down. A box truck was also blown over by the winds on U.S. 33 between Scottslawn Road and U.S. 42. Additional photos of the damage can be found on the Journal-Tribune’s 13th Page on its E-edition.